Shop PreSonus AudioBox USB 96 Digital Audio Recording Interface from AMS with 0% Interest Payment Plans and Free Shipping. Free STUDIOMAGIC Plug-In Suite PLUS New Lower Price! Great interface for small projects! 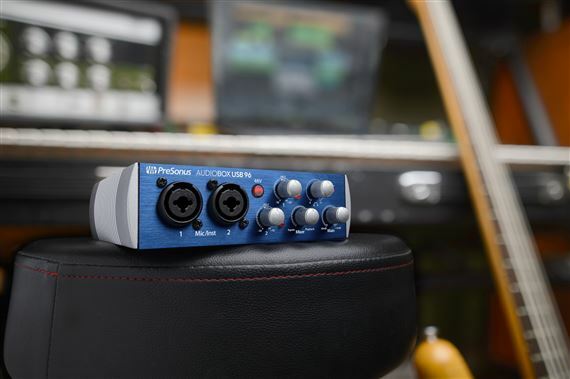 I have owned many Presonus products over the years and they continue to make excellent products. I use this for small home projects and does the job wonderfully. Highly recommended for any recording situation. My interface came in fast and I love the way it sounds! I needed a new interface fast and this one came in right on time as expected! The free and fast shipping is a life saver! easy set-up as well, and once I got it up and running I was more than pleased with the way my reference monitors sounded playing off this interface. Honestly for the price you really can't beat this deal! Great value. Packed with usable features. Fun and easy to operate. Good starter interface. MIDI and USB ports are a plus. This is a great product. Well worth the $100. Works well and sounds great. This is great sounding interface. I use this & the vsl22 for mobile recording they both sound very good.